Since inception, Hip-Hop has been closely tied to the fashion industry. Everything about Hip-Hop culture is unique and distinct in terms of style and fashion. Since the wave is now growing and the sound diversifying, for its second year in a row – Indian Hip-Hop has taken over Lakme Fashion Week! And in 2019, the year kicks off to a great start. 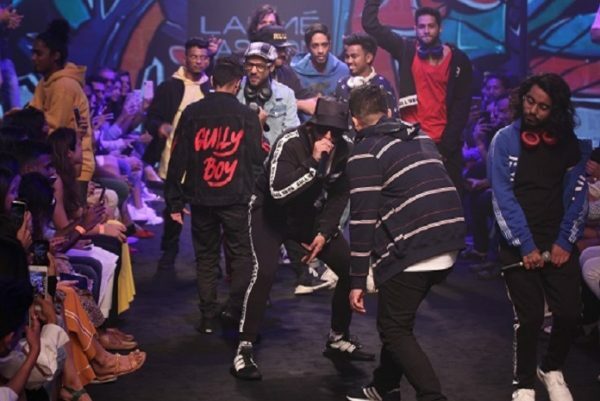 The rappers have walked the ramp side by side with the models in past years, but this year the presence of actor Ranveer Singh promoting Gully Boy gave this event a boost like none before it. It has always been the story that in India, everything sells more with more star power attached to it. This is not to say that rappers weren’t already reaping the benefits of their hard work, but to say that this acts somewhat as a catalyst. Naezy, MC Altaf, Noxious, Kaam Bhaari among other emcees put on a show for the audience and indeed made statements with each line rapped at the event. Gullyboy is definitely a benchmark in the Indian Hip-Hop Industry. The movie will act as a catalyst to the acceptance of Hip-Hop beyond the local followers. The future is in the artists hands to build and grow. This is a statement not just in style, but in vision and growth. The event although had a few hassles when Ranveer Sing stage dived into the crowd without warning and hurt a few people. The interwebs have pled him to tone down the extra enthusiasm. All in all, many more such events will make sure that the scene is noticed and the true voices come forward and shine. Here’s to more great music in the year to come! 2019 is the year for Desi Hip Hop!